We've been around the block for the Manchester Curry Night (it's been going since the last millennium!). To keep track of all the places we have been to, I've set out a handy list below. Unfortunately, apart from a limited amount of information from an email in 1999, records don't exist from pre-2000 (sniff). 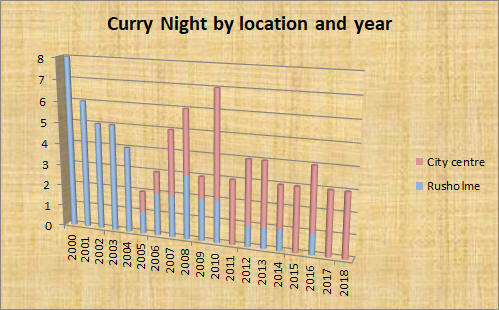 First, though, you can first see some graphical depictions of the Curry Night, before the full list of all recorded Curry Nights. 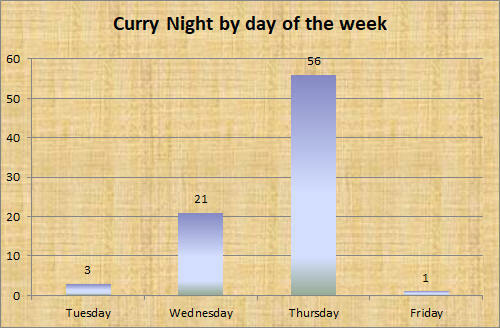 To try to illustrate the history of the Curry Night in graphical form, spaceman turned to Excel's graph-making facility. Firstly, it is interesting to see how visits to the city centre of Manchester have slowly but surely replaced those to Rusholme over time. 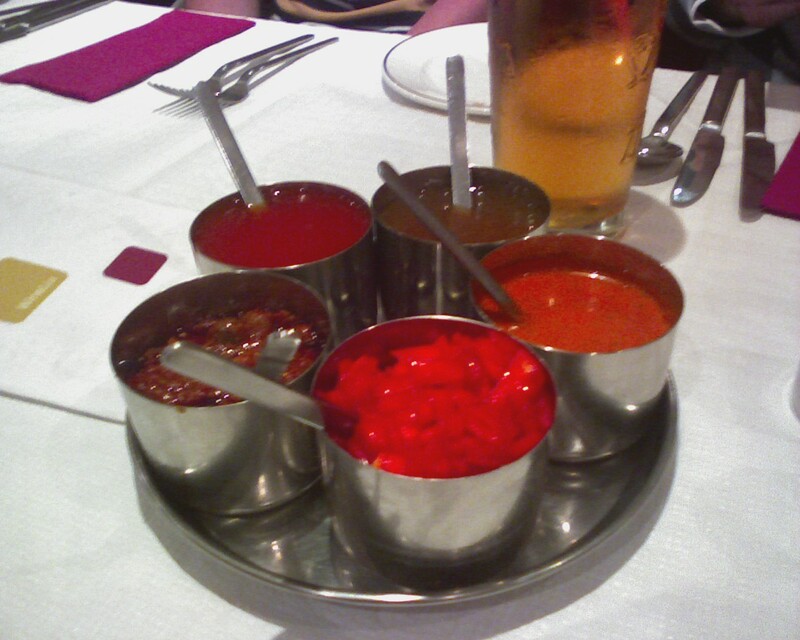 We still go to the neon curry capital on occasions, but more in the of way dutifully visiting an elderly relative. There's also no sign of a Curry Night in decline. Whilst not as often as it was in its early years (as you might expect), it is still remains a broadly quarterly occurrence, dipping during 2004/5 as spaceman spent a lot in time in London during that period. The results of the next analysis were not surprising since Thursday, in spaceman's view, is the best night on which to organise a work social. (Whilst Curry Nights are absolutely not limited to work colleagues - indeed, alumni and other halves are positively encouraged - there is always a core from the office, giving it a work social feel.) This is because people often have plans for the weekend, but by Thursday it's almost the weekend and people are more tempted to let their hair down. (For a similar reason, we've had no Mondays.). However, in 2016 and 2017, Wednesday slowly started to catch up as it became a popular voting choice.